Daisy Ridley Tells GMA The Last Jedi Is More Surprising Than The Force Awakens. Full Interview. Warwick Davis Talks The Force Awakens. First Hint for the Poster? 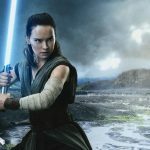 The Resistance Broadcast – Is Luke Skywalker the Reason for Rey’s Force Awakening? Star Wars: The Force Awakens: The Cosmetics Of An Icon! Star Wars: The Force Awakens’ Make up line hitting in the Fall?